The height and velocity of each incoming tide cannot be exactly predicted. Strong winds in particular will cause variation, and as the strongest winds in the region of the Severn estuary often blow from the south west major tidal surges may occur during stormy weather. Around the Awre promontory there were frequent attempts to claim land from the estuary. They were not always successful. 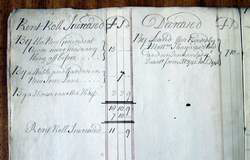 In 1745 the accounts of Gloucester City Corporation, then the owners of Awre manor, happily recorded an additional annual rent of £15 “By the New Grounds at Awre never made any thing off before”, but just two years later the accounts were obliged to record, in handwriting noticeably less embellished with loops and twirls, a decrease of £15 rent “By New Grounds being lost”. These accounts can be seen at the Gloucestershire Archives, record number D 3270/19672, accounts of 1745-6 and 1747-8. The reference to these accounts came from the Victoria County History on Gloucestershire, Volume 5, published in 1996. The section on the parish of Awre contains a treasury of information, and can be read online at this address. We do not know when the hamlet of Woodend was created. The suffix “end” implies that the settlement was established as an offshoot of the village of Awre. At some point a judgement was made that the estuary bank was stable enough to make it worthwhile to build on it. Early in the eighteenth century there were at least six houses there. 1 The production of salt. 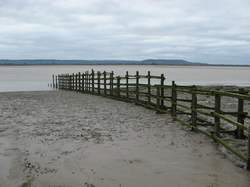 A salt pan at Awre is recorded in the Domesday Book of 1086. It produced 30 packloads of salt. Its location may have been just up the lane from Woodend as an orchard with the name Salt House Orchard is shown there on the Tithe Map of 1840. Water from the sea would have been allowed to run into a lagoon, and salt would be collected once the water had evaporated. 2 Fishing. Equipment used at Woodend included long nets and putchers. Salmon were the main target, but occasionally sturgeon were caught. If the rules were followed any sturgeon would be surrendered to the lord of the manor as it was regarded as royal fish. 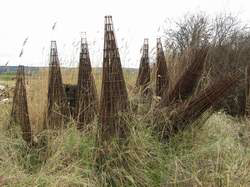 As we shall see, fishing with putchers is still done, but the raw materials for the putchers has changed from branches of willow and hazel to steel coated in plastic. For further information on putcher fishing go to this address. The putcher weir shown on the photograph on this webpage appears to me to be the one at Woodend. 3 Navigation. According to Keith Kissack, in the seventeenth century the Severn was navigable as far north as Welshpool and at that time was the second most busy river in Europe (after the Meuse). K Kissack, The River Severn, Terence Dalton, 1982.